Posted March 19, 2017 by Xuan Tran & filed under Side dish, Vegetables. Kimchi is undoubtedly the most famous food of South Korea and the signature dish in daily meals of Korean people. As a big fan of Korean culture, I’m very amazed at the importance of kimchi in this country’s cuisine. Kimchi is present everywhere, from family meals to restaurant dishes. The harvesting season of napa cabbages and radishes has become the traditional season of making kimchi. If you have seen Korean dramas, you would have noticed the images of Koreans eating rice or ramen with kimchi, and enjoying it to the fullest. A variety of dishes adapting kimchi as the main ingredient have been created by the Koreans, from soup to rice. So let’s discover how Koreans traditionally make kimchi, and take a bite when the kimchi has been fully fermented to know why kimchi is the life and soul of Korean cuisine. In this post, I am introducing two ways of making kimchi: the traditional way and the easy way for vegan. The recipe requires quite a few ingredients, but it is quite simple to make with a high success rate (I’m 100% sure that the kimchi will ferment successfully). As the representative of Korean food, the traditional kimchi has a freshly sweet flavour of vegetables, well maintained in a combination of sour and salty brine and a touch of “sea” from shrimps/anchovies/fish sauce. The vegan kimchi, to my surprise, is as crunchy as the traditional one with a perfect harmony of flavours – definitely worth a try. Table salt is the fine salt. The salt : water ratio is different if you’re using sea, coarse salt (see below). The amount of ingredients is for 1 kg cabbage. If you’re making more kimchi, the amount of ingredients should be increased accordingly to the amount of cabbages. Carrot, radish and spring onion are optional, but they add a better taste to the kimchi. Spring onion can be substituted with chives. Soak the cabbage in salt or salt water until the cabbage is firm and crunchy, then rinse the cabbage. – Firstly, I soak the cabbage in salt water instead of sprinkle salt on the cabbage leaves, since submerging the cabbage in salt water makes it more crunchy. Especially for easy kimchi, after chopping the cabbage in bite-sized pieces, they are soaked in warm salt water so that they turn crunchy and firm, rather than too firm or too soft. Moreover, soaking in salt water also helps stimulate and speed up the fermentation of kimchi. – For traditional kimchi, I only quarter the cabbage, but feel free to chop the cabbage into pieces as in vegan kimchi. For chopped cabbage, the soaking time should be shorter and the fermentation speed is faster. Kimchi is easier to make this way but it can’t be kept as long as traditional kimchi. The flavour and crunchiness is the same for chopped kimchi and quartered/halved cabbage kimchi. 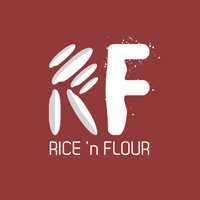 – If you don’t have sticky rice flour, you can use leftover rice or sticky rice instead, by simmering them in a pot with dried shrimps/anchovies until softened to be blended into puree. The rice flour helps kimchi ferment faster, but it is optional. – Apart from apple or pear, Koreans also use ripe persimmon in kimchi. Persimmon has natural sweetness, thus, it’s unnecessary to add more sugar (I will try persimmon next time when it’s in season). – Ginger, onion and garlic contribute to the flavour of kimchi, thus they are essential as ingredients but to be used in moderate amount. Too much of these ingredients will give kimchi a really strong taste. – If Korean chili flakes are not available, feel free to substitute with other types of chili powder, for example, cayenne for the spicy flavour and paprika for the red colour (paprika is not spicy). – Vinegar is optional in making kimchi, but it really helps kimchi ferment faster and more easily. – For better fermentation of kimchi, you should use 0.5 to 1 tbsp. Gochujang chili paste (since it is quite spicy, the amount of chili flakes should be decreased). This is a short-cut to make kimchi and different from traditional way, but very efficient since Gochujang has already fermented, thus easily stimulating the fermentation of kimchi, even when the kimchi is not salty enough. The flavour of Gochujang doesn’t affect the authentic flavour of kimchi. – If you’re not a vegan but you prefer making easy and quick kimchi, you may want to follow the instruction of making vegan kimchi while substituting salt by fish sauce. In my opinion, the taste from shrimps/fishes adds a nice umami flavour to kimchi. 1. Split napa cabbage into halves or quarters along its length. Or chop the cabbage into pieces of 3cm in width. Rinse carefully and let them dry at room temperature. 2. Mix salt with water with a ratio of 50 gram salt : 1 liter water (if you’re using coarse salt, the ratio is 90 gram salt : 1 liter water). Soak the cabbage into the salt water. Remember to submerge the cabbage into the salt water, possibly with the help of heavy objects like a bowl or plate to press the cabbage down. Soak in salt water in 8 to 12 hours until the cabbage softens and firms up, and can be bent without breaking. For vegan kimchi, heat water until warm (about 40 – 50ºC/104 – 122°F – a little hotter than bath water) and soak the cabbage for 4 to 8 hours until the white parts are bendable (the cabbage should also be submerged in salt water). 3. Squeeze water out of the cabbage and let the cabbage dry at room temperature while preparing the fillings. 4. Rinse dried shrimps/anchovies carefully and cook them in 200 ml water in 30 – 40 minutes. Save some broth (about 150 ml), let it cool and add sticky rice flour to the broth and stir well. Cook on medium heat and stir constantly until the mixture is cooked and turns into runny porridge. Set aside to cool. Skip this step for vegan kimchi. 5. Rinse and peel carrot, spring onion and radish. Grate or shred the carrot and radish. Cut the white parts of spring onion diagonally and chop the green parts into 3 – 4 cm length. 6. Add apple, onion, ginger, garlic and cool porridge into blender and blend well (or chop them well). Add fish sauce, sugar, chili flakes, vinegar and mix well. For vegan kimchi, blend or chop apple, onion, ginger, garlic, then add Gochujang, honey or sugar, salt, chili flakes and mix well. 7. Add spring onion, carrot and radish to mix with the spice mixture. Take a piece of cabbage to try with the filling. It should taste a bit saltier than normal so the kimchi can ferment. The sweet and spicy taste should be moderate. 8. Spread the filling onto the cabbage leaves. Or add chopped cabbage and mix well. Roll the kimchi and keep in airtight container. 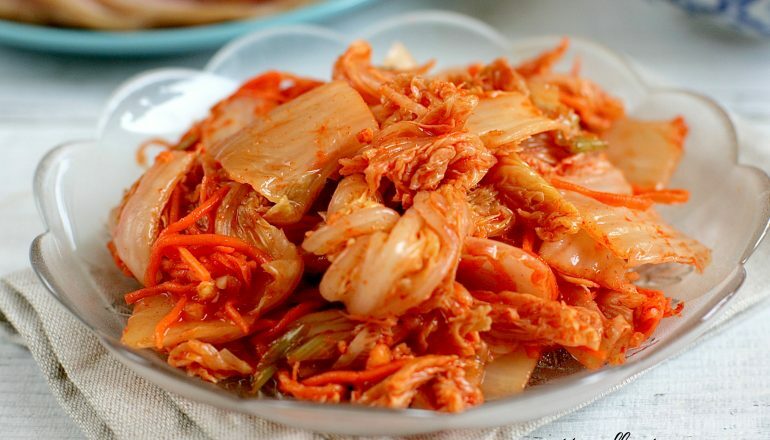 It takes kimchi 24 – 36 hours at 20ºC to ferment. After it has fermented, keep the kimchi in the fridge for later use. The higher the temperature, the faster the fermentation and vice versa. Chopped kimchi ferments faster than quartered/halved cabbage kimchi.